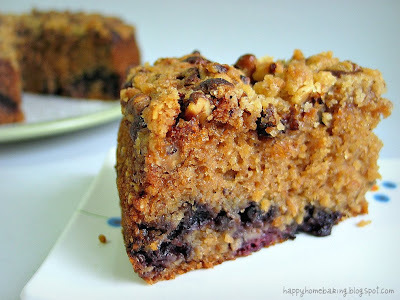 This blueberry streusel coffee cake was the first thing I made once I am back to my usual baking routine. I took the recipe from this book, and if you happen to click on the link, you would probably know why I have chosen this recipe. I simply couldn't resist the mouth-watering photo on the front cover. Besides this recipe, I have already bookmarked a couple of other recipes from this book. I bought 4 packs of blueberries a few weeks ago when they were on sale at the local supermarket, they were half the usual price. In the past, I would never place more than 2 packs of blueberries in the shopping trolley. Besides the price, I knew I would have problems trying to use them up before they turn bad. This mindset has changed since I chanced upon this site. I have now learned how to freeze blueberries. This has certainly make life so much easier for me. I followed the method closely, although I didn't wash the blueberries before freezing, as I guessed they were already pre-washed. I did thaw and washed them before use. This cake recipe is available here. Even though it is not called for in the recipe, I dusted and coated the blueberries with flour before mixing them in the batter. Alas, this extra step didn't help to prevent them from sinking to the bottom of the cake. I think the next time I were to bake this again, I would sprinkle the berries on top of the batter instead of mixing it with the batter. Except for the crunchy sugary streusel toppings, the cake was very moist and the sweetness just right for me...partly because I didn't 'pack' in the brown sugar when measuring them with my newly acquired set of measuring cups, and I have already formed the habit of cutting down the amount of sugar whenever I can. The use of brown sugar not only enhanced the flavour, it also gave the cake lovely golden brown crumbs. The blueberries were a disappointment though, they were rather bland after baking. They didn't pass my kids taste buds either. My younger boy purposely left the bottom layer of his slice untouched, giving the reason that he was already very very full, and yet, he had room for extra streusel toppings from my share. 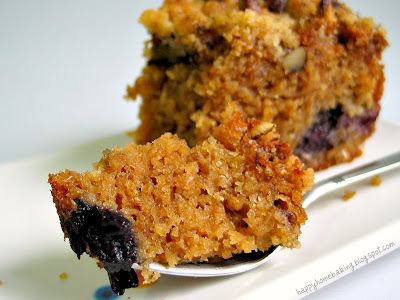 Besides the blueberries and walnuts, the cake is made with equal amount of plain and wholemeal flour, which makes it a very wholesome cake for breakfast. I find that it tasted best when served warm, and I must say it is a perfect companion with a steaming cup of freshly brewed hot coffee. It was a pleasant surprise to know that Eliza at Notes from My Food Diary has passed on this cute award to me :) Thank you so much Eliza!! 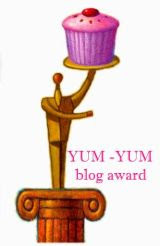 It's now my pleasure to pass on the award to the following floggers for churning out delicious food, post after post! wow.. this cake looks so yummy. Thanks for sharing. I shall try it soon. Wow..the texture looks great and I would love to try it but I dun seem to see any blueberries fresh/frozen at our supermart here.:( . So I have to add this to my To-Do list. As soon as I can get the blueberries, I will bake this...looks great. 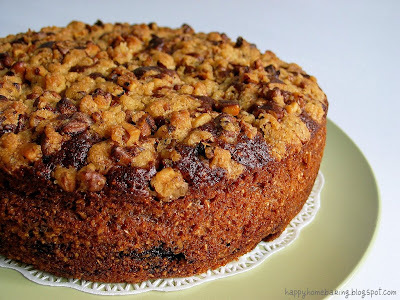 I love cake that is moist..:) Thanks for sharing another wonderful recipe. Your sweet treats looks so sumptuous! They made me drool :p! May i know where you learn how to bake these? I'm a beginner at this and don't know where to start from, thank you! That coffee cake looks so good! I keep seeing blueberry cakes popping up everywhere- perhaps it's a sign i should break into that bag of frozen blueberries sitting in the freezer. Thanks for sharing the site about how to freeze berries. I'm sure it'll come in really useful the next time the berries go in sale- hopefully i'll catch them at the right time. Anyway thanks for the award HHB- what an honour! Hi thecoffeesnob, you are most welcomed! Looks fantastic! They texture look so good! I want some!! keke, I also bought 2 packs of blueberries during the sales and the kids did not like the smoothies I made with it, so now the other pack is sitting in the freezer. Any idea how long can I keep them frozen? Sherlyn, I am quite certain that your kids wont be able to taste the wholemeal flour in this cake. They will like the toppings. I am not sure how long the blueberries can be kept in the freezer (maybe 6 months or so? ), but I will certainly use them within a couple of months. HHB, but I will have problem finishing the rest of the pack. Perhaps must find some other baker who stay near me to share the ingredients keke. Luckily u say the berries can keep maybe 6 months .. so i still hv at least 4 mths to think abt what I want to do with them. congratulations on the award, and it's an honor to receive it from you! I wish we are living nearer and have the opportunity to eat some of your delicious looking baked goods! Your cake title and nice pictures attracted me very much. After i read the recipe, i realise the ingredient of coffee wasn't there. 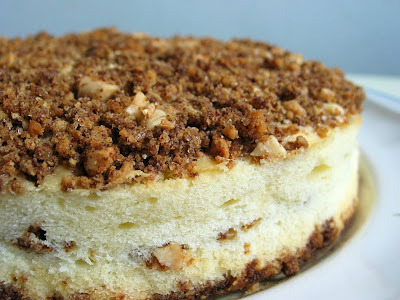 i am thinking why it is called streusel COFFEE cake, was it just the printing error? your cake looks soooooooooo yummy!! Thank you so much for this recipe.taste so so yummy!! !